If you know Howard Hunt (aka Slim) and his Gospel sound —and if you’re a quartet enthusiast, you know them well— then you’ve been waiting a while for this live project. 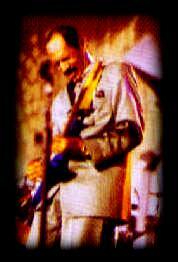 Recorded in Danville, Virginia in the summer of 1999, Slim and the Supreme Angels offer up more of the stuff that has made them legends: tight musicianship from expert musicians, beautiful song-writing by Hunt, and all the diverse toppings that go hand in hand with quartet projects are on this disc from MCG Records. While it's hard to pick one Angel over another, it's not hard to single out Robert “Sugar” Hightower. Wearing a groove into the metal with his rousing guitar work, he's a legend in his own right. On “Saved and Sanctified”, the truth is thumped into pocket, with Sugar taking over from vocals mid-track, delivering riff after riff of hard-nosed, six-string triumph. On vocals, the Supreme Angels demonstrate again that their extreme moniker is no exaggeration. Slow ballads in particular showcase their gift for honey-dipped vocals. Take your pick of “Give Me Flowers” or the gorgeous double-track story/song and title cut, “Blind Man”. Hunt’s distinctively nasal-patterned tones carry the day on a couple of cuts. In particular, the album-ending “I Trust in God (Altar Call)” hits heavy, as he pours out his simple and powerful testimony. The remake of "Stay Under The Blood" can't be left unheralded either. My personal favorite would have to be "He's The Way", as it wraps up all the best elements of the Supremes into one package: great lyrics, traditional groove and catchy melody while showcasing group and lead vocals. 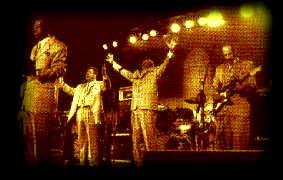 In an era in Gospel where head-nod inducing urban jams take prominence, rest assured that traditional grooves can still get that nod going in a hurry too. 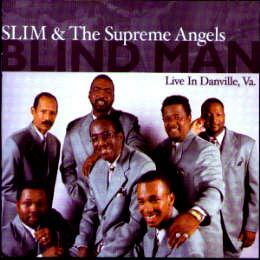 Slim and the Supreme Angels certainly do that on Blind Man.